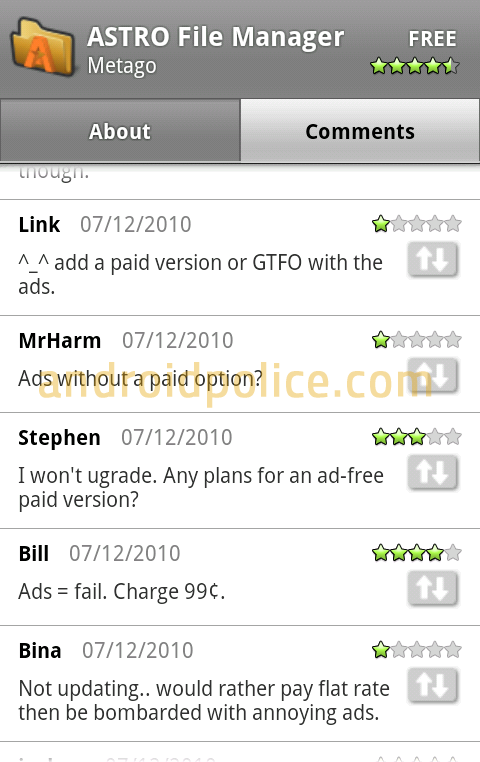 Astro File Manager: Now with Forced Ads! Before I start I’d like to make on thing clear – I think ASTRO File Manager is a superb file management application and I have nothing against their developers or the app itself! If you’ve used an Android phone, you probably know what Astro File Manager is. Briefly, it’s a file management application that lets you organise, edit, and manage the files on your SD Card. Not only that, but it also comes bundled with extra features such as application backups, task manager, SD Card Usage monitor. 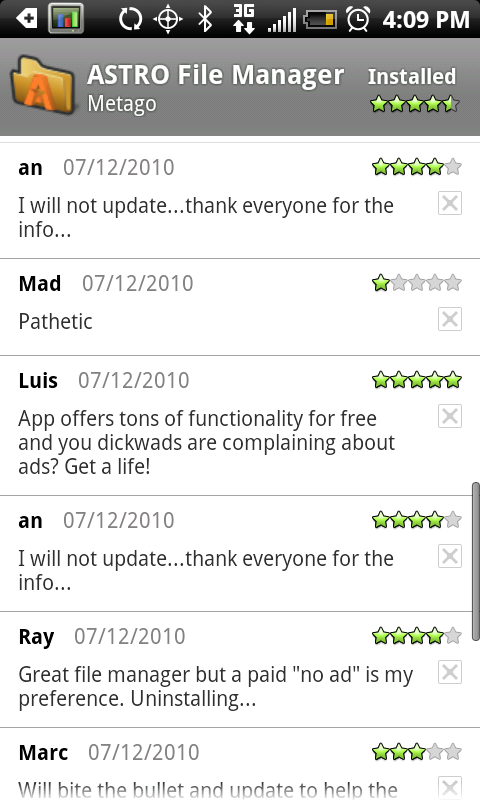 Overall, it’s a great application all-around. 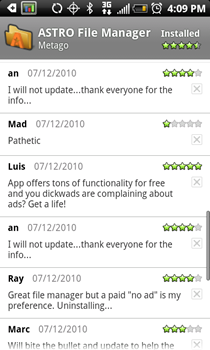 Up until now this application has been free, with no advertisements (although there was always a beta expiration warning when you first ran the app). 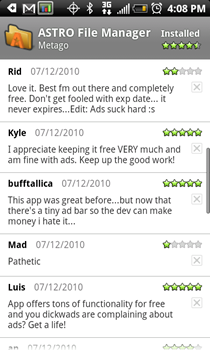 Today, however, the developers have launched an update which contains advertisements within the application. 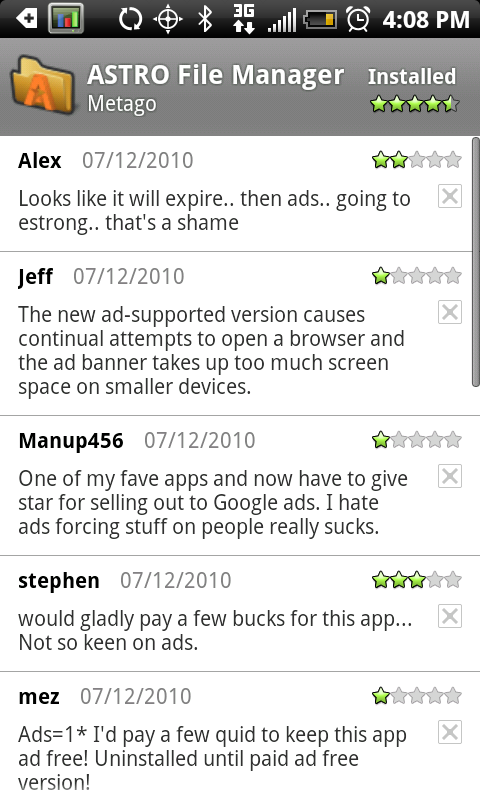 In itself, this isn’t a problem - plenty of applications have ads and some users are happy to put up with them. Most applications have two versions: a Free/Lite version which has either limited functionality, advertisements, or expires after a certain period of time, and a full paid version which has no restrictions whatsoever. 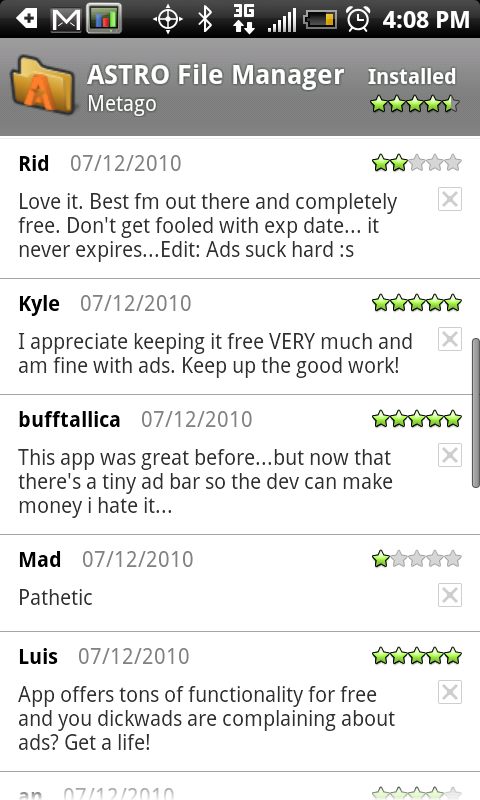 The issue here is that they haven’t created a paid version – users have no choice but to use the version with ads. 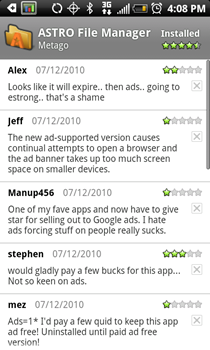 As a result, many disgruntled users of Astro are voicing their concern in the app comments in the Market, simply because they hate the ads and would be very willing to pay the price to have the advertisements removed. I think this is a key lesson, not just for the developers of Astro but for all other developers, too. As long as your app is valuable, loyal users will support it by purchasing a paid version (and Astro is clearly one of these great apps - it currently ranks #1 in the File Management category). Similarly, users should appreciate that devs spend a lot of time creating applications, testing, fixing, releasing and then improving based on feedback. It’s unclear whether there’s a paid version in the pipeline, but if there isn’t, such unexpected and forceful ad introduction was definitely the wrong move. Let’s hope that the developers of Astro respond to this positively and release an ad-free version of Astro at a reasonable price.